Batang Pinoy - Ngayon at Noon, a Facebook page recalls the time when the government used to distribute food to public elementary schools back in the early 1970s, during the regime of former President Ferdinand Marcos. 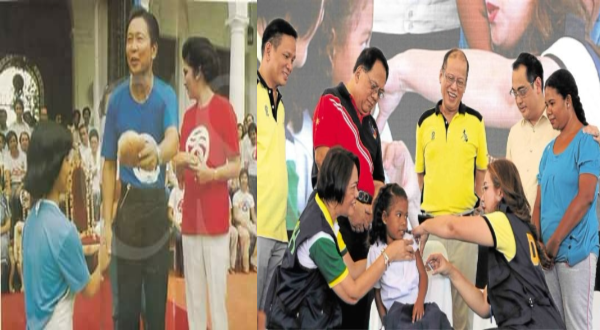 One of the most successful feeding programs was the Nutribun program, which was designed to give combat the malnutrition of children. It was an genius idea of Marcos, in which he thought of taking advantage of the food that the United States was sending through their Food for Peace program, to start this Nutribun program. With the flexibility of the recipe of the Nutribun, the philippines eventually took over of the feeding program, incorporating local ingredients and utilizing local bakeries. This gave hope for children, jobs and the utilization of local goods, it was a remarkable program that was hitting three birds with one stone. The community of Batang Pinoy sadly stated that, despite the presence of poverty, programs has ceased to exist at times like today. Succeeding presidents have proven themselves incapable of addressing the most immediate problem of thousands of Filipinos, hunger. "Oo masarap yan at malaman pipila tlaga lahat kami sa buong klase.. bigay ni marcos yan kaso nwala na eh nung inalis sya sa pwesto... eh ang aquino ngaun nag bigay ng libreng turok ng dengvaxia ayun napahamak ang libo libong mga bata.."